Mr. Chancellor, Dr. Roch Carrier is a national literary treasure and one of the most influential champions of bilingualism in both French- and English-speaking Canada. His books and stories, still taught as part of school curriculum across Canada after several decades, help Canadian children understand French-Canadian and English-Canadian identities through humour and symbolic references to national pastimes such as sport. Dr. Carrier became a household name among countless Canadian families after the 1979 release of his literary masterpiece for children, Le Chandail de hockey – The Hockey Sweater. His place in the literary history of our country was reinforced again in 1992, when he was awarded the coveted Stephen Leacock Memorial Medal for Prayers of a Very Wise Child. In addition to making his mark in children’s literature, he has written dramatic works for the stage and novels that thematically explore war, nationalism and French Canadian culture. Born in Sainte-Justine, Québec, he studied at the Université de Montréal and at the Sorbonne, in Paris, where he received a doctoral degree in Literature. In addition to his success as an author, he has also served the national Arts community as Head of the Canada Council for the Arts from 1994 to 1997 and as National Librarian of Canada from 1999 to 2004. 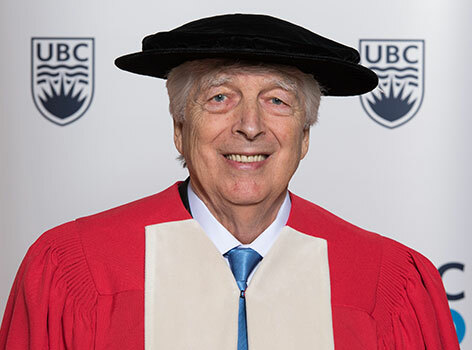 I am particularly pleased to note that Dr. Carrier has a special connection to this university, as the founding Honorary President of The Centre de la Francophonie de UBC. In 1999, he was appointed an Officer of the Order of Canada, and continues to actively promote Canada’s official languages in all parts of the country. Mr. Chancellor, in recognition of his lifetime commitment to French and English languages and cultures in Canada, I ask you to confer the degree Doctor of Letters, honoris causa, upon Roch Charles Carrier.